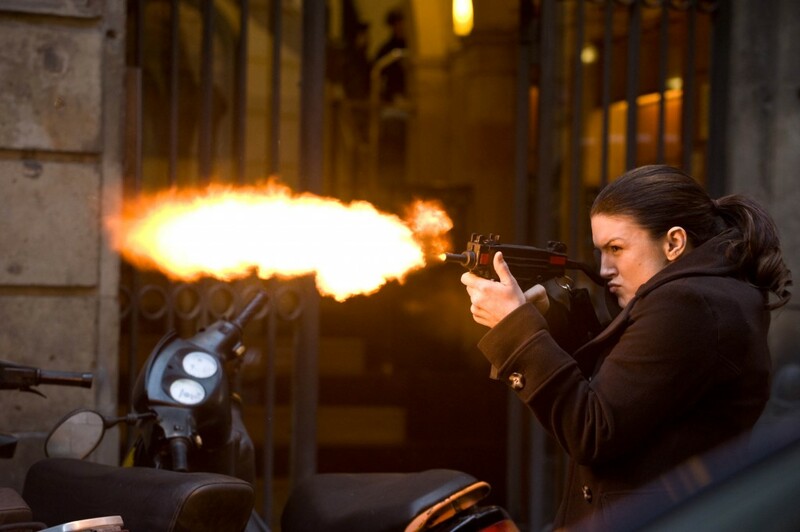 There’s not a ton of info out there about Steven Soderbergh’s action flick Haywire, at least in terms of what sets it apart from every other “electrifying tale of espionage and betrayal.” We know it stars MMA starlet Gina Carano, who apparently “really delivers as a screen presence. She looks comfortable, and then she tears these guys in half.” Our first look at the film seems to back that promise. Who might she be tearing in half, and why? I can’t currently say, but depending on what side of her allegiance they fall, Carano will have some formidable enemies and/or allies in the rest of the cast, which includes Michael Fassbender, Ewan McGregor, Antonio Banderas, Michael Douglas, Bill Paxton, and Channing Tatum. Soderbergh has nebulously described the film as being “in the vein of Traffic, an entertaining multi-layered story about something timely right now,” but really we can only look to the fact that he directed it and it was written by Lem Dobbs (The Limey, Dark City, Hider in the House) for any idea what Haywire will be like. At least until a trailer hits. The film bows after Contagion, the other near-release Soderbergh flick that rejoins him with Matt Damon for a viral outbreak thriller.